I want to let you in on a little secret, the best value out there are the 6X6 paper pads. For $6.99-11.99 (depending on the manufacturer) you get the paper line but in smaller size. 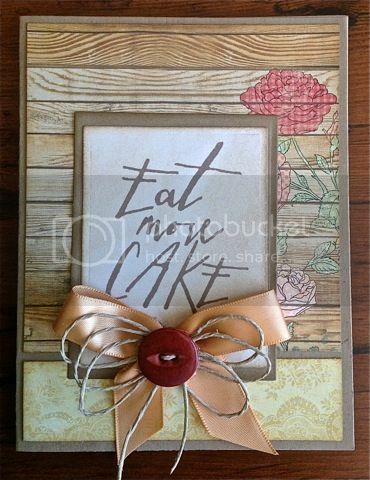 These pads are perfect for making embellishments (think doilies, banners and paper flowers) to layers for a 12X12 layout to a series of cards. I call that great value. I realized my kids had been raiding my card stash again (actually the kids told me it was getting to be slim pickins in the card stash) so I thought I would get to it and start to build it back up. 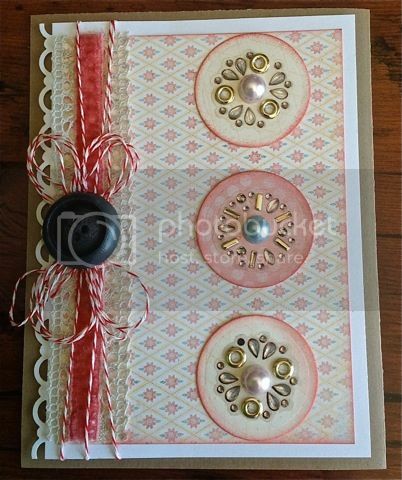 It is nice working with the paper pads because once embellishments and such are out, it all coordinates with the entire pad. 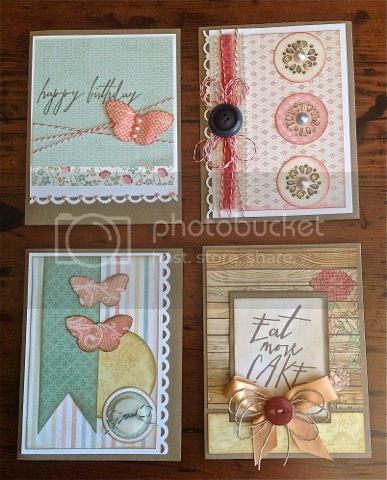 Let me show you a few of the cards I made while I had a paper pad out the other day. 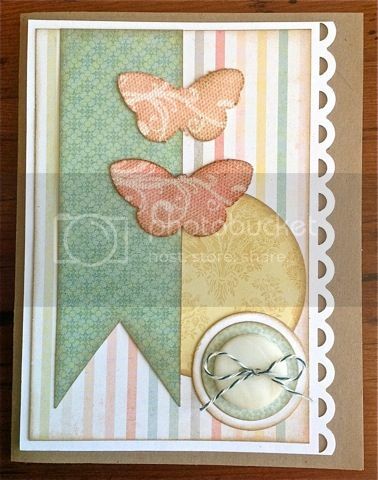 See those butterflies… they are Prima resist canvas. They are wonderful to work with. You just ink or spray them up to coordinate with whatever you are using them on. In this case, I inked them up to coordinate with the pink stripes from the backround paper. As the ink is applied, the resist pattern appears just like magic. 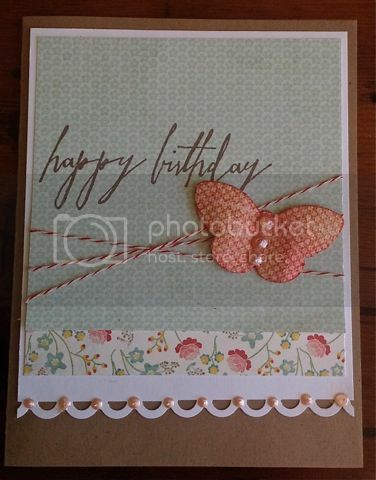 I love the Tim Holtz handwritten sentiment stamps. It is fast becoming one of my go to stamp sets. A quick way to add more pop to your bows is to layer them. In this case, I just layered with a twine bow on top and added and antique button to finish it off. Here are all the cards together. We set up a table at the front door of the luncheon hall where our friends and relatives could see and touch and smile to remember some of the artifacts of his life. Included in this were some of the tools of his mechanic’s life and trade, his battered old lunch box and thermos, cufflinks from a very long ago era, just a very FEW of the great gobs of keys he carried around (I doubt even he knew what most of them unlocked) and of course his loved and worn Bible. And photos. LOTS of photos. He wouldn’t have a scrapbooker for a daughter and not be represented in photo-form. Then on each table we adorned with 1 of 2 kinds of photo candle votives. Of course Pinterest was the inspiration and the Dollar Store was the source! For the tall votives, we printed a photo onto white vellum and wrapped it around the outside of the glass. The 8.5×11 size was a perfect fit for a horizontal photo. I wish I’d had the presence of mind to snap a photo of them while lit, because the candle makes the photo glow and it’s beyond lovely!! The other style of table decor was a shorter, fatter candle votive (approx 5″ tall). Mr B came to my rescue and went out and cut me some branches of varying heights that fit into the jar around the candle. I printed an assortment of black and white photos from the 50’s and 60’s and tucked two each into the jar between the branches and the glass. And in the end, these candle votives made a sweet way to say “thank you for coming” to several close friends and extended family, as we invited them to choose one to take home with them. Once again I’m reminded how little effort it actually takes to make something even more beautiful and memorable than it might ordinarily have been.